Nothing to do with my PC, other programs work fine, my fiber connection is still fast so it a server problem from NORTON servers? Edit: I CAN download virus defs but it takes soooo long till it finds them.. slow server from Norton maybe? Other users have the same problem? Before that try to check and see if your time zone is correct and time is up to date. Also try after some time, may be its a network clog in your area. We will have to wait until the mods ok your screenshot to see it. We will also have to wait and see if there are any other complaints about a slow server. In the meantime, have you cleaned out your computer from dust and other debris, deleted temp files and cookies, defrgged and emptied out browser history. I am having no problem getting my updates. I just tried it and got 1 update that was done in the blink of an eye. In the meantime, have you cleaned out your computer from dust and other debris, deleted temp files and cookies, defrgged and emptied out browser history. It may very well be a ISP problem having to do with your network. The routing sometimes gets bogged down and you might have a bottleneck. If it lasts for some time, you could give your ISP a call and see if they are having any problems. Thanks. Anyone else not receiving pulse updates as frequently as normal? A server issue? I'm getting pulse updates as usual, I'm not seeing any difference. Maybe someone else could confirm this? They're coming through like normal now. Still waiting for the latest virus def to be pushed through though. It was probably an issue with the server on a specific area. Yes I can also confirm that ALL updates have been VERY slow for the last few days, or about a week. I am based in UK and it is every single time. I do all updating manually and even the small ones (appx 63kb) take a minute or two, in fact with the small ones it quickly reaches the 50% mark (32kb) and then sits there for another minute or two. Can someone at Symantec please look into this as it is getting to the point where I am considering trying a different security product from a different vendor as this is becoming very tiresome. Have you ever restarted your computer and turned off your modem in the last days? I never had these problems and I had never heard users complaining to a low speed when downloading updates until today. Usually, when server doesn't work, the updates were not downloaded at all. It would be interesting to know if other users are having the same issue. I received the last Virus definition update at 12.40 PM CET, less than 6 hours ago. There is perhaps a bit delay for the UK area? Might be. Which def set are you on? I restart the machine every day as I always turn it off at night. Same with the router. And I guess I should have mentioned that all other internet activity is perfectly fine at usual reasonable speeds. Here is the antivirus definition site where you can check when antivirus definitions come out. It shows that so far for today, there has only been 1 update for antivirus definitions. 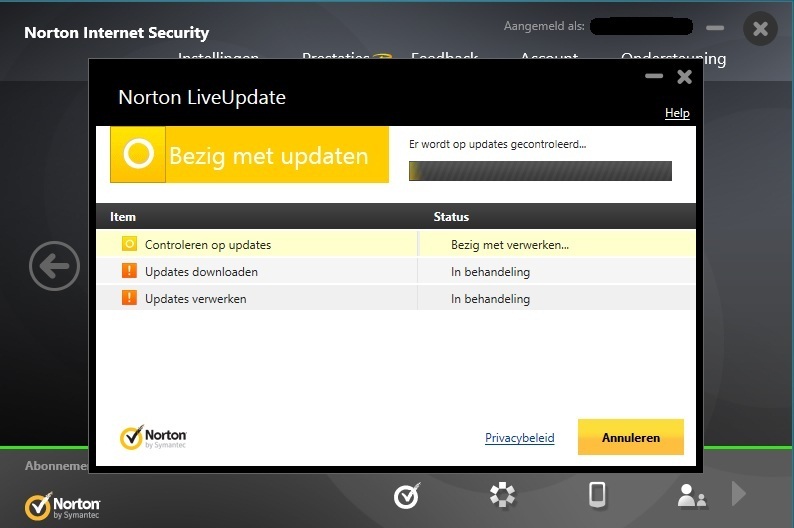 http://norton.com/nrnr that provides to uninstall and reinstall a fresh copy of your NIS, keeping your personal settings. Once the setup is complete, run LiveUpdate repeatedly, until NIS says the product is updated and no update was found.